Hi there! Today’s post is about how to do foil manis. It’s super easy! See it for yourself! 1 Paint your nails. Any normal polish and colour will do. Avoid quick-dry formulas. 2 Wait for your nails to dry. Once the polish is dry to the touch but still tacky (you need to be able to leave a fingerprint), it’s the perfect base for a scattered foil mani. 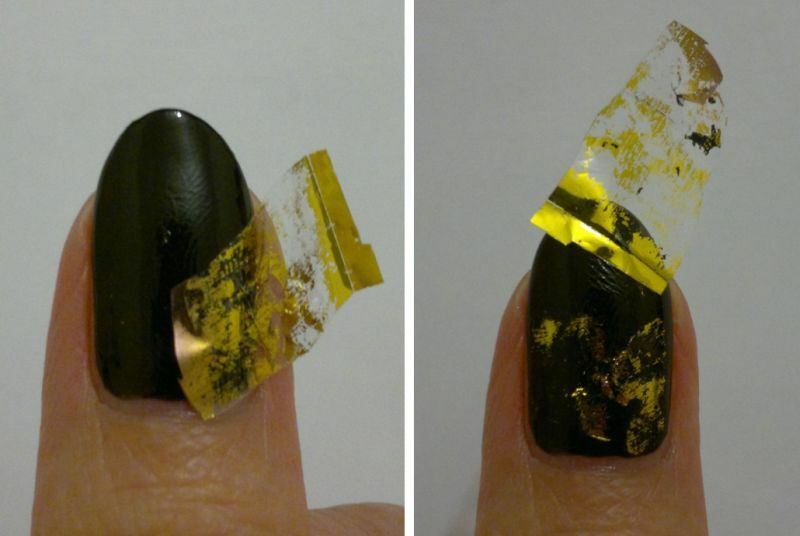 3 Press a piece of foil onto your nail. Try to “rub on” the foil gently. Then rip it off – like a plaster. 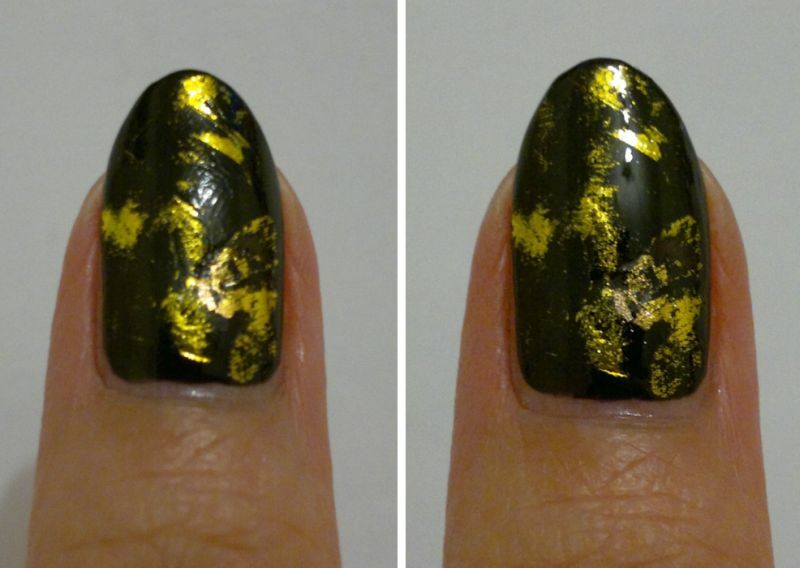 Don’t try to pull off the foil gently as it will take the polish with it. If this happens, don’t panic. Just reapply the polish, wait for it to dry, and try again. 4 Repeat as needed / wanted. 🙂 Use different colours if you want… the possibilities are endless! 6 Apply 1 coat of normal clear polish or top coat as this will make your nails look and feel 100% smooth (bye-bye fingerprints) and glossy within seconds. Avoid quick-dry formulas as they will shrink the foils (which isn’t a good look at all). You can achieve 2 finishes – see the tips and tricks section below! Now your work is literally done! How easy is this?! I’ve done foil nails for many years. Back then all I had was polish and foils, but none of the “tools” they say you need. But guess what, I didn’t need any of the tools, and it took me 5 minutes to figure out how to do foil manis using polish and foils only. And you can do it too! On to the tips and tricks! Again, don’t use any quick dry formulas. You can’t work with quick-dry base colours because the foils need to stick to a tacky surface, and you can’t use quick-dry top coats because they will literally distort the foils underneath. If you’re not sure what and where to buy, I would recommend this particular set of foils for £1.99. This set is cheap, but it will give you a number of different foils to play with. I’ve bought a lot (!) 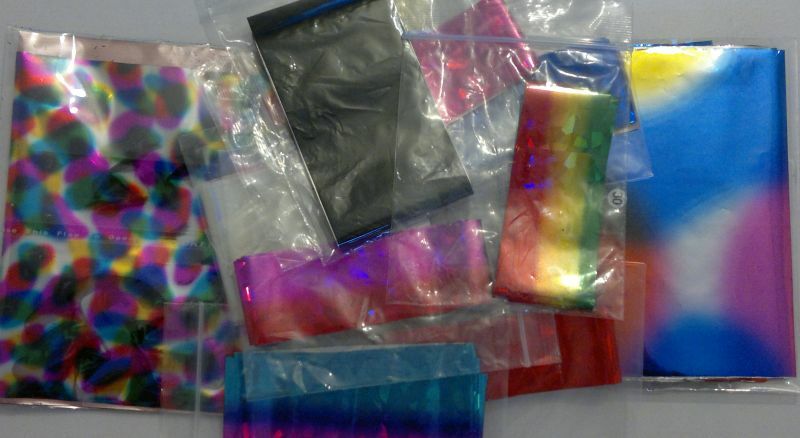 of stuff from this ebay seller over several years – foils, decals, glitter, buttons, etc, and I’ve always been 100% happy. There’s one more thing. Don’t ever throw away any leftover foil. I promise you that you will make the most beautiful manis or accent nails using leftover foils. 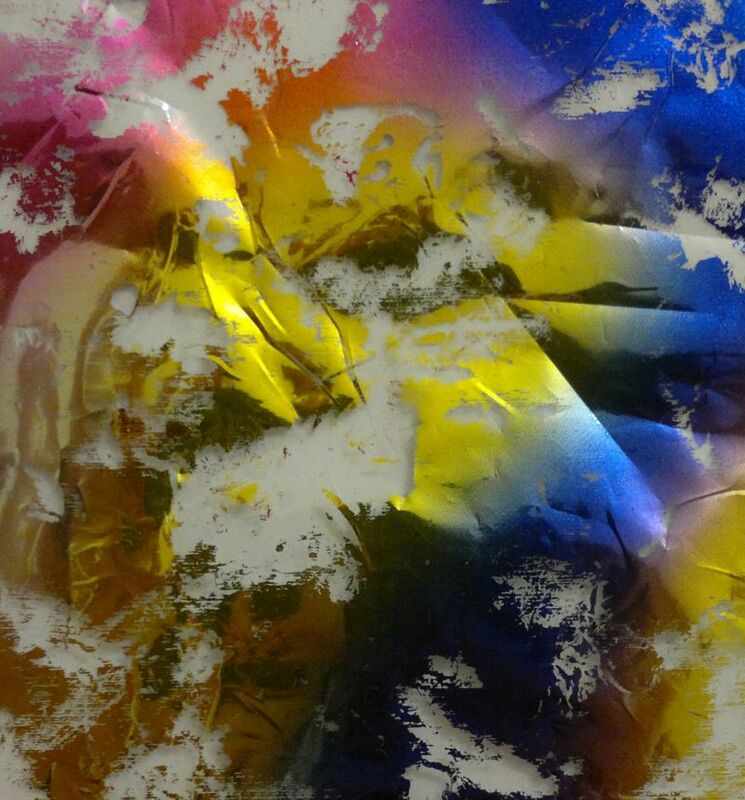 In the pic below you see a piece of a large 20cmx20cm piece of foil. I used this exact “leftover” piece to make a number of awesome manis, such as this one and next Wednesday’s foil mani (you have to patient). Make Your Own Stamping Polish! 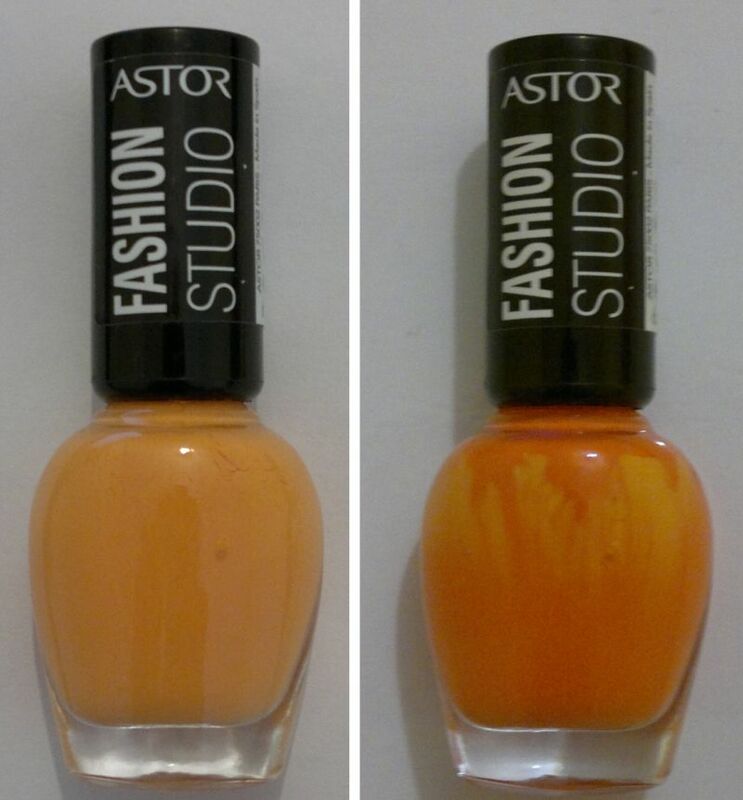 I knew I wouldn’t use that orange eyeshadow, so I just crushed it up and funneled it into my (unloved) light orange Astor nail polish (which I might have another bottle of…). The 2 ingredients formed a thick paste, so I used some nail polish thinner to turn the paste into a liquid. Then I asked my husband to give the nail polish a good shake. Of course, I tried my home-made stamping polish right away. I stamped an image onto black paper, and I couldn’t be happier with the result. And I’m really proud of myself for turning 2 unloved products into 1 product that I’ll actually use! Have you ever repurposed a beauty product? If so, what did you do? Feel free to get in touch, and thanks for stopping by! Hi there! Today’s post is an incredibly long and photo-heavy one. 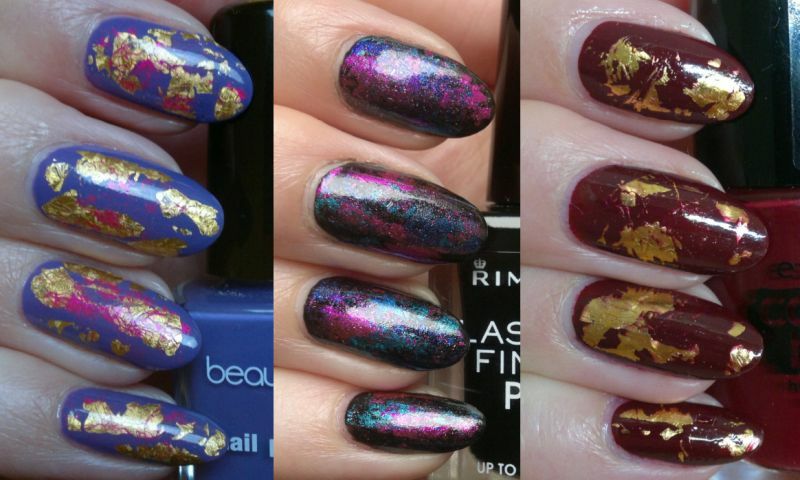 It’s about everything you need to know about nail stamping. I’ve stamped for years and I’ve accumulated quite a collection of all things stamping-related. But you don’t have to splurge – especially if you’re a beginner, or if you just paint your nails occasionally. In this case you only need for items to stamp. And most women already have one or two of the things required for stamping. So, if you want to know everything about stamping, just read on. I’ve prepared a step-by-step guide which I hope will be helpful. 🙂 Chapters 1 to 4 are about the stamping stuff you need, chapter 5 is about how to stamp, and chapter 6 is about tips & tricks. Now get a drink and maybe some food – because this post is really long! This is easy! Like I said, in order to stamp you only need four things: a stamper (1), a scraper (2), a stamping plate (3) and nail polish (4). Sure, you need clean up stuff – but we’re only talking cotton wool pads, q-tips and nail polish remover – and an old magazine (or something similar) to protect your workstation. OK, let’s get started! There are lots of different stampers out there. I started with the basic round, pink stamper (1), but I bought different stampers over the years. I really love the pink stamper because it’s firm and it picks up images perfectly. This stamper is 2.3cm in diameter (I measured! 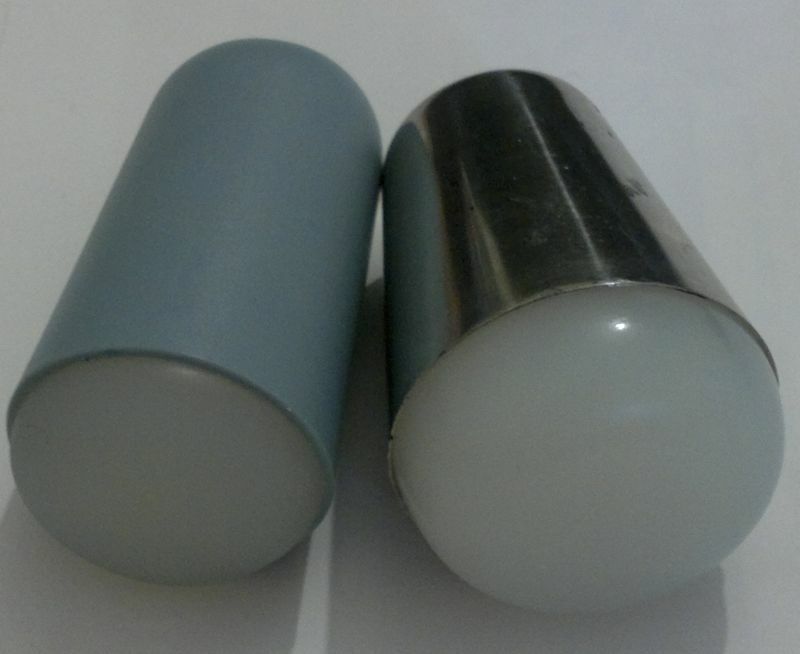 ), so unless you have very long talons, this stamper will definitely be big enough for you. This stamper is really great for images of all sizes – and I would recommend it to everyone – not just to newbies. 🙂 How do you clean this stamper? In 5 seconds – with a drop of nail polish remover and a q-tip. The green stamper (2) isn’t my favourite. It’s rectangular and it’s a bit bigger than the pink one (it’s 2.6cm x 1.6cm) – but it’s curved so it’s not the best stamper for curved nails (like mine). However, it’s great for smaller (and shorter) nails and smaller images (especially if you stamp on several different images) because it let’s you see where you stamp. 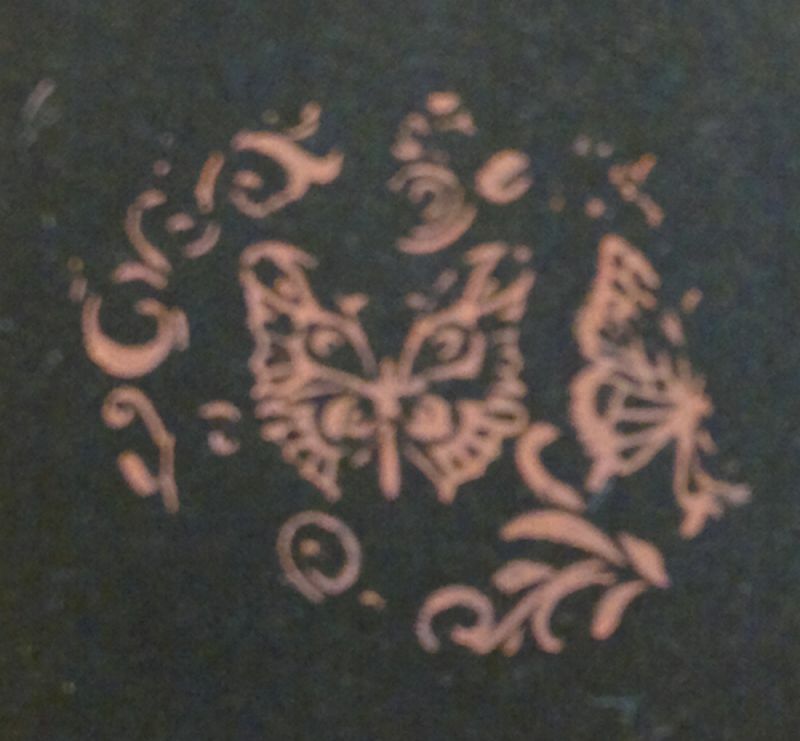 But if you don’t get this one in a stamping set, you don’t need to buy it separately because the pink stamper can do almost everything this stamper can do. How do you clean this rectangular stamper? In 5 seconds – with a drop of nail polish remover and a q-tip. And then there are jelly stampers. These have become really popular over the past year or so. I bought one as soon as I found one for cheap. There are semi-firm jelly stampers (3) and ‘real’ marshmallow stampers (4). 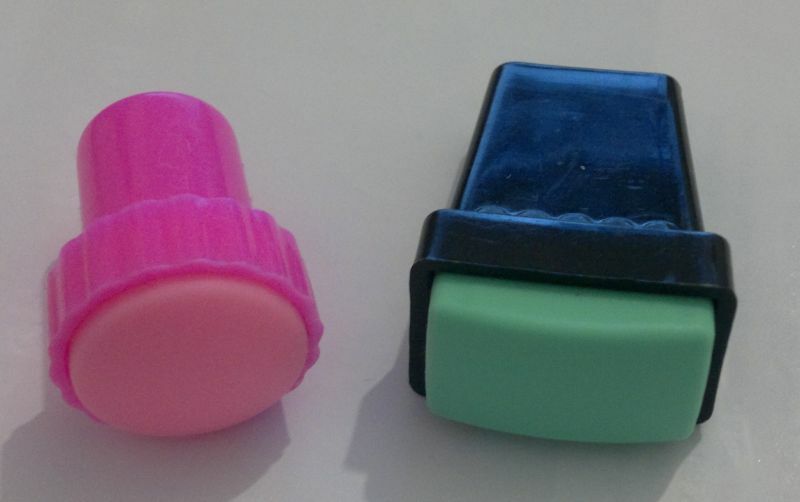 These stampers come in different sizes and colours – but the clear stamper head is one of the main reasons they’re so popular. 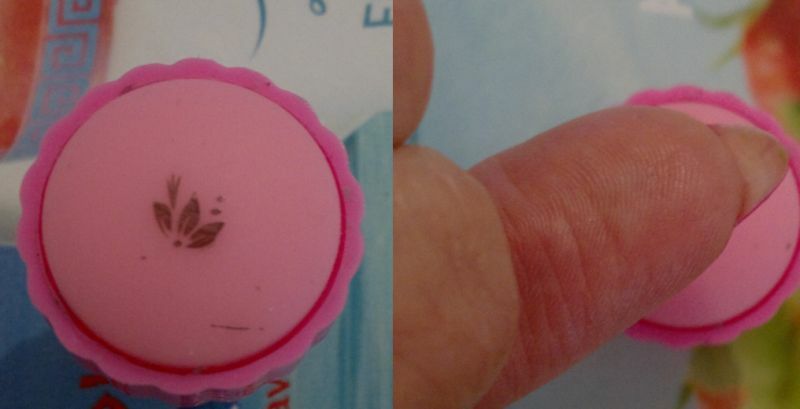 Now, my semi-firm jelly stamper is 2.8cm in diameter – so this one is great for very long nails. And it’s actually quite firm (which I prefer). My marshmallow stamper is 3.2 cm diameter – it’s really big. Both stampers do their job well – although both stampers seem to have trouble picking up images from some of my cheapo stamping plates. (That’s why my pink stamper will never retire!) But there are quite a few differences between the different jelly stampers. Sure, there are lots of different sizes. But the main thing is that there are sticky and non-sticky jelly stampers. Sticky ones are recommended for starters – but honestly, I don’t think they make stamping easier (it is easy enough as it is). And once you’ve mastered the skill of stamping (you’ll do that in a few hours), you’re not a beginner anymore. So if you want a jelly stamper, I’d definitely recommend you buy a non-sticky one. 🙂 Another thing about sticky stampers is that they’re really sticky. And they will gather dust. A lot of dust! What the problem with that? 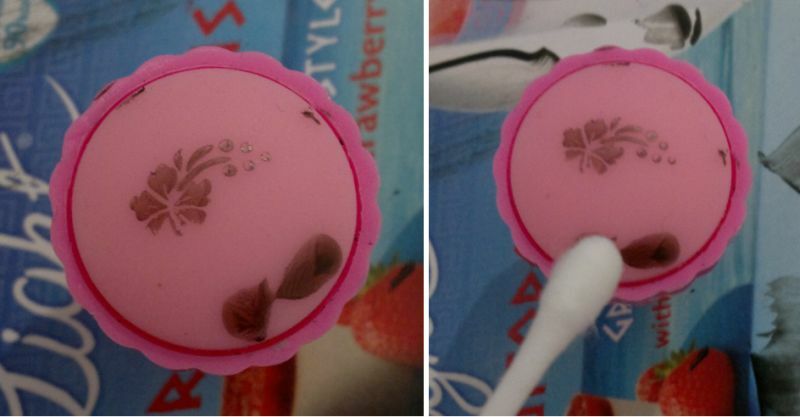 Well, you cannot clean jelly stampers (sticky and non-sticky) with nail polish remover as this will damage them. 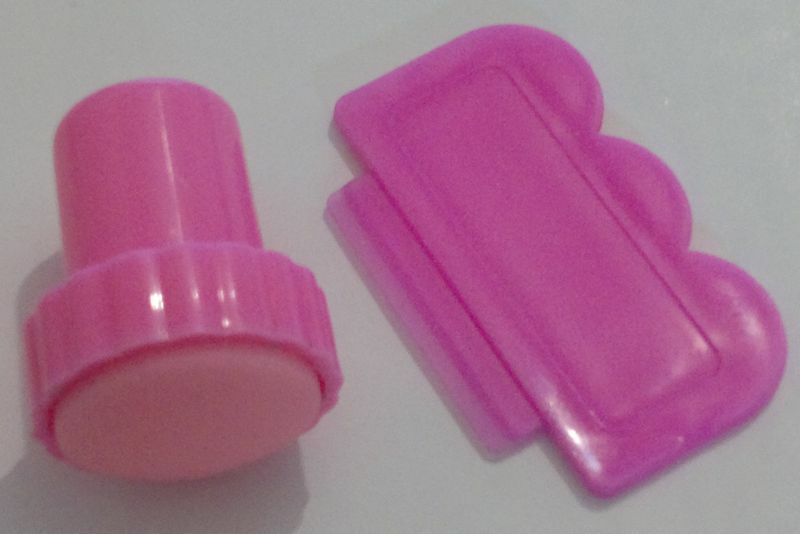 Most people seem to use sticky tape to clean their jelly stampers. But I wipe my jelly stampers with a make-up remover pad drenched in facial toner. Yes, that removes all the polish easily. I’m using this alcohol-free facial toner to clean my stampers. There are a few different scrapers out there. Scrapers are either 100% plastic – or they’re plastic with a metal blade. Don’t use the ones with a metal blade (throw them away unless you can use them somewhere around the house) because they will only scratch your stamping plates. I’ve also had different plastic scrapers. The ones that came with the jelly stampers were rubbish. But the ones that came with the round, pink stampers (the pink stamper & scraper are usually available in a set) are great. I don’t know how many stamping plates I have, but considering that I have sets and single plates, I know I have more than 150. Maybe even 200. But when you just start out – or if you’re still looking into whether stamping actually is for you, all you need is 1 stamping plate to practise and to play with. Now, let’s have a look at what kind of different plates there are! Shapes and sizes of stamping plates vary greatly. There are round, octagonal, rectangular or square plates. The regular round plates are 5.5cm in diameter (although there are bigger round plates) – but I also have a few XXL plates which are 16.3cm x 10.3cm. Yes, these plates are huge! Look at the difference! 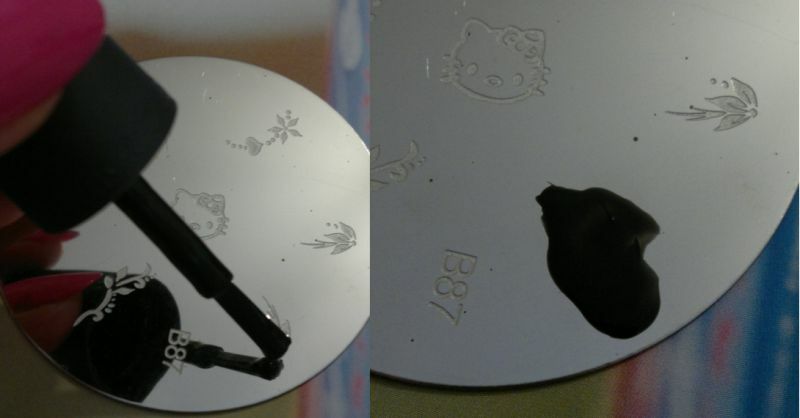 Then there are differences in the kind of images on the stamping plates. Some plates only have French tip designs (don’t buy), some have smaller images (great for accent nails and individual and unique designs), some have full nail images (these can be tricky – I’ll explain this in the tips and tricks section), some plates have a mix of these different images, and some plates have all-over images. This would be another thing I reckon most women have at home. Depending on what you want to stamp and which colours you want to use, you might actually have all that’s required! Most of us (that includes nail nuts like me) don’t need (define ‘need’…) stamping polishes in dozens of different colours. Especially not when we have certain colours already. 🙂 Saying this, Essence does an excellent white stamping polish which is £1.50 only – and yes, when it comes to stamping white onto black (or other dark colours), a regular white polish really won’t do. But then – the Essence stamping polish is dirt cheap anyway! The next pic shows what Essence’s stamping polish can do! And lots of colour polishes will look nice when stamped onto a white base. But not every colour polish works for stamping. 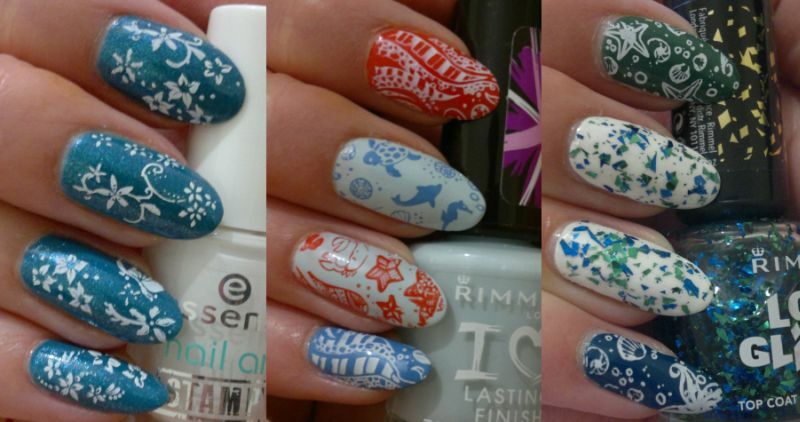 You might want to test if your polishes stamp well – just try them all by stamping random images onto white paper. This will also let you practice stamping! As a general rule, when you try out your polishes for stamping, forget the ones that aren’t opaque or at least almost opaque in one coat. Polishes which require three or more coats to be opaque are simply too thin and not well pigmented – so they won’t work well for stamping. And there are polishes which your stamper really won’t pick up – in this case, just move on to the next polish. Now, stamping lighter colours onto darker base colours can be very tricky. I do have a few polishes which work for this purpose (as you can see here) – but most of my lighter colours don’t work with darker base colours (they’re hardly visible). So you might want to try yours by stamping lighter colours on black paper. I’d generally recommend Sally Hansen’s Insta-Dri polishes because most of these look nice on darker base colours – and these polishes can often be found in discount stores. My entire Sally Hansen Insta-Dri collection came from Poundland, Poundworld and the likes. Let’s start! Apply a base coat to your nails (or hardener, clear polish, etc), let it dry, then apply your chosen base colour to your nails, let it dry, and then apply a top coat (that’s optional – but if you like to top coat your nails, now’s the time to do it). OK, once you’ve got your base colour sorted and the polish on your nails has dried, you can start stamping! Then you just ‘scrape’ away the excess polish with the scraper. You don’t have to scrape like a maniac because all you’re doing with this step is wipe the excess polish off your stamping plate. All it usually takes is one swipe (hold the scraper in a 45 degree angle) – and that’s it. But if you need two swipes, that’s fine too. 🙂 Now look at the stamping plate. There’s your image – and it’s ready to be picked up! Now look at your stamper. Does the image look right? If not, just stamp it on to whatever you’ve used to protect your workstation or clean the stamper with a q-tip and a drop of nail polish remover. Then try again! If the image looks right on the stamper, well done! You’re almost there! 🙂 All you have to do now is transfer the image onto your nail. Don’t press the stamper onto the nail – but DO press your nail into the stamper – ideally with a rolling motion. You could say you’re ‘rolling on’ the image! And now it’s done! Seriously, it’s done! The image you stamped on will dry in seconds (once you stamp it on, it actually is dry) and you’re good to go immediately! 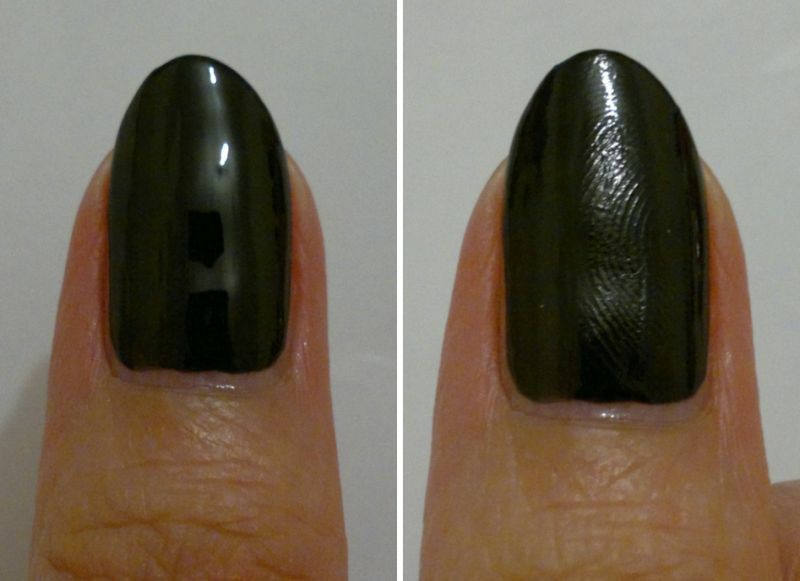 You can stamp images all over your nail(s) – but how many images you stamp on is entirely up to you. 🙂 Or you can do one accent nail only. Or use different colours… you decide! Oh, and if you stamp on skin, don’t worry. Just clean it up with a drop of nail polish remover and a q-tip. 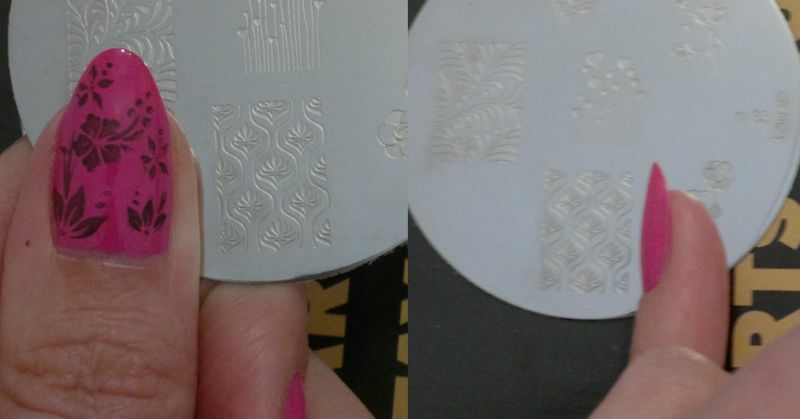 Now, let’s recap: You apply polish to the image on the stamping plate, then you scrape off the excess polish, you pick up the image with your stamper, and then you transfer the image onto your nail. If you think this sounds quick and easy, you’re right. Once you’ve stamped a few times, this won’t take longer than five seconds (ten seconds tops) per image. I’ve stamped several different images onto all of my nails and I doubt it took longer than five minutes to do the entire mani and to clean up the stamping plates in between. 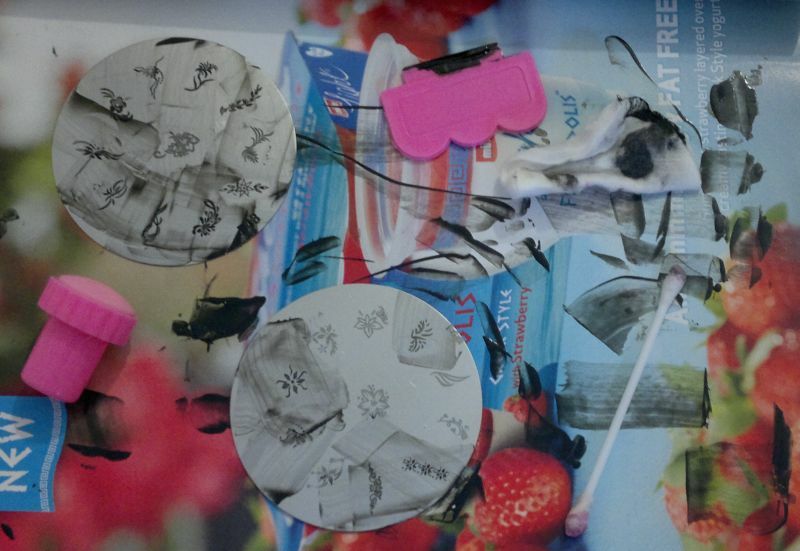 You see stamping is messy – the two stamping plates I used to stamp on different images are covered in nail polish. You can also see that I wiped excess polish off the scraper several times. And there’s a used q-tip and a used cotton pad from cleaning up in between. But you know what’s great? Once the polish is dry, you just turn the page and there’s your workstation protection for the next stamping adventure. And cleaning up the utensils is easy – just read on! Before you buy stamping plates, measure your nails. It’s important to know the length of your nails because many full nail images will either be too small or too big for your nails. I’m taller than average, my hands are bigger than average and so my nails are longer than average. My nails aren’t that long at the moment, but my longest ones (as of today) are 2.3cm (thumbs and ring fingers). Whilst my nails don’t look like talons, they’re longer and bigger than average. Actually, my nails are even longer than the images on Moyou’s XL plates! So please measure your nails before buying plates with full nail images. That’s a Konad plate. 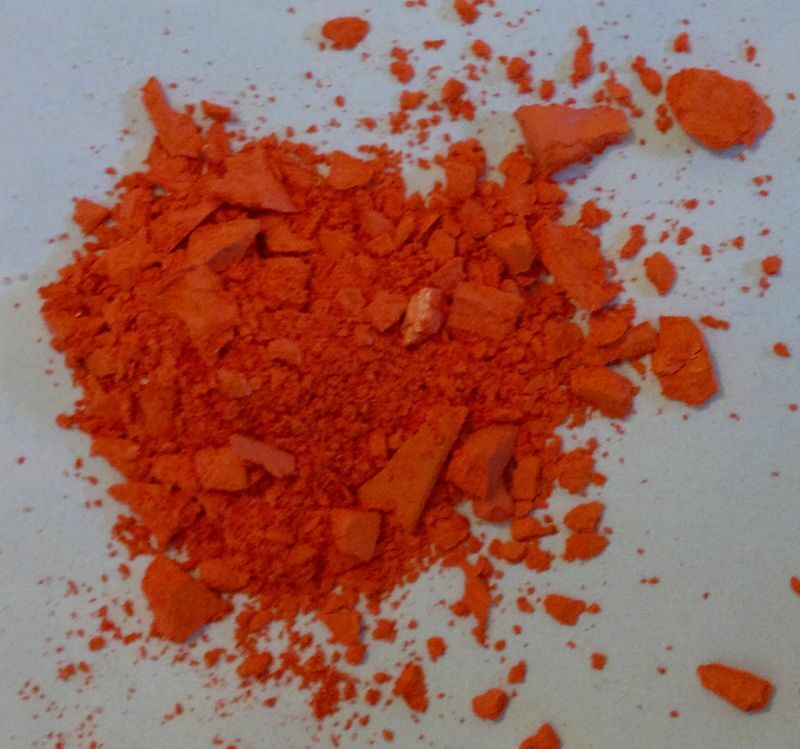 The image is really pretty – but it’s 1.6cm x 1.2 only. I can’t use this image at all – not even on my (relatively) short pinky! I guess the image would be fine for short ladies with smaller and shorter nails though. Anyway, most of these full nail images are too small for my nails – no matter what stamping plate manufacturer we’re talking about. 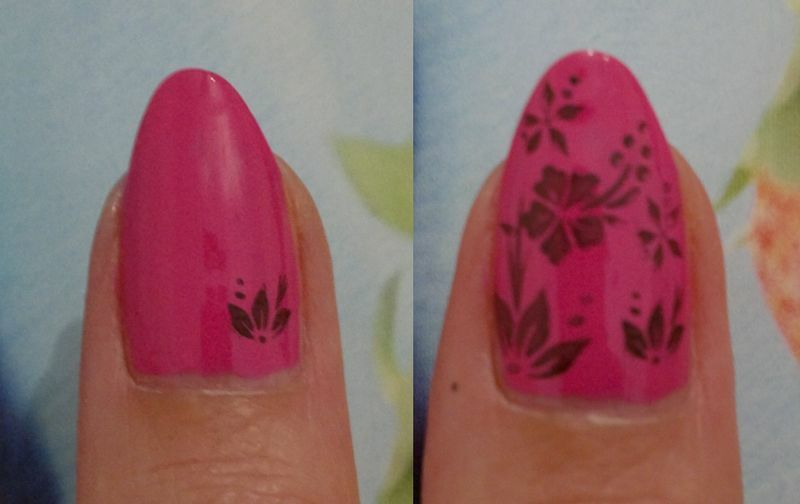 But I generally prefer all-over stamping plates or plates with smaller images which I can combine as I see fit. 🙂 In any event, measure your nails! Top coat your nails before you stamp (optional) – but don’t apply top coat on top of the stamped images. Again, some nail gurus will tell you that you need to ‘seal your design’ (rubbish), and I’ve even read about special stamping top coats. But don’t worry – you’ll have tip wear and the polish will start to chip long before the stamped-on images show any weaknesses. But if you really, really want to apply a top coat, try to top coat each nail with one swipe (this won’t work on long and big nails) and with as little pressure or force as possible. Don’t drag the top coat over your nails because this will ruin the image. And you might not want to use actual top coat, but simple clear polish (in my experience the regular clear ones are better than the quick-dry ones). And that’s it! At this point I want to thank you for reading this! You’ve been patient. Very patient. And you deserve praise! I’ve read the entire post about 20 times – but hey, that’s how it works. 🙂 Again, if you read this post – or even half of it, thank you! Enter your email address to follow my blog. This way you receive notifications of new posts by email.